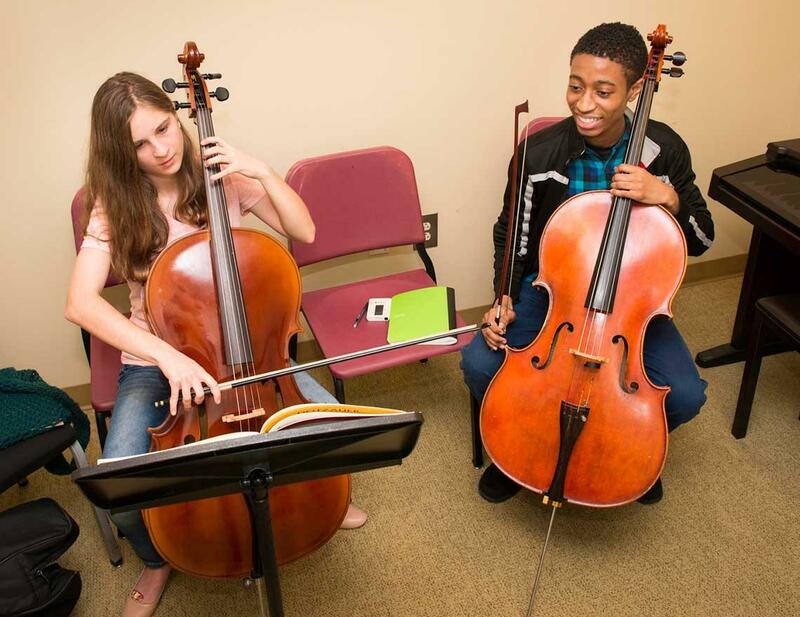 The USC String Project provides instruction in violin, viola, cello and bass through group classes and orchestras. The nationally recognized program offers beginning classes for children in 3rd through 5th grade and beginning classes for adults. 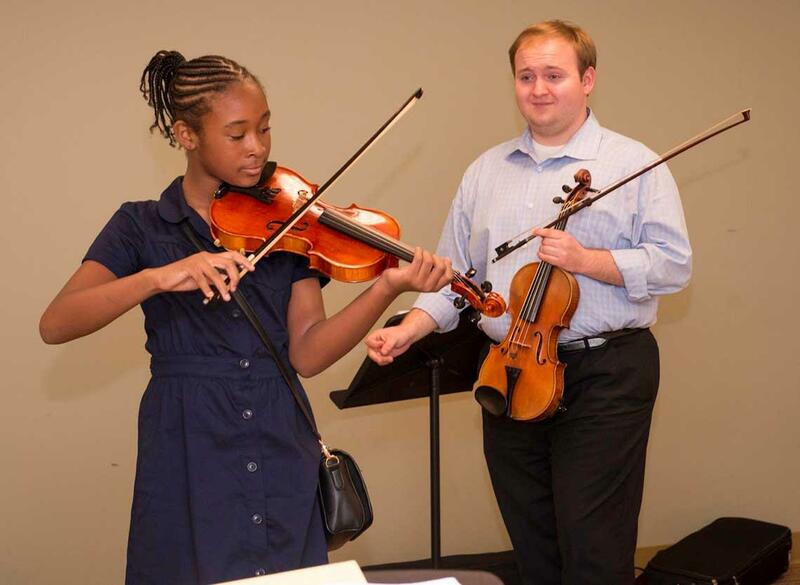 Continuing students can receive private lessons and play in String Project orchestras through high school. Teachers are undergraduate and graduate students supervised by USC faculty members. 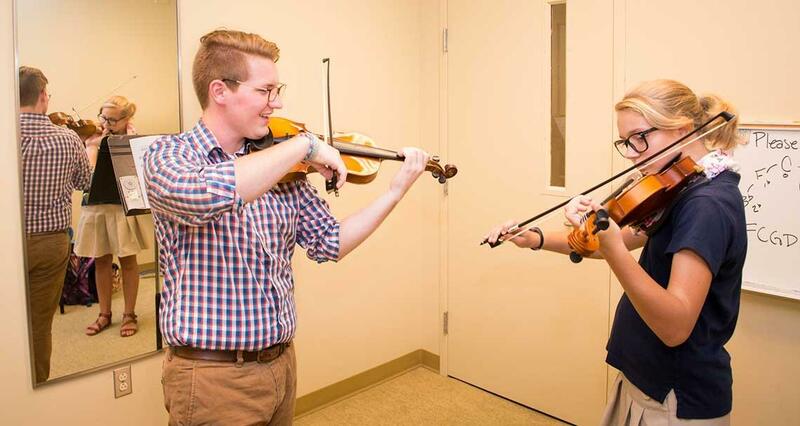 USC’s String Project is a model of community service and teacher education for more than 40 other university programs across the country. 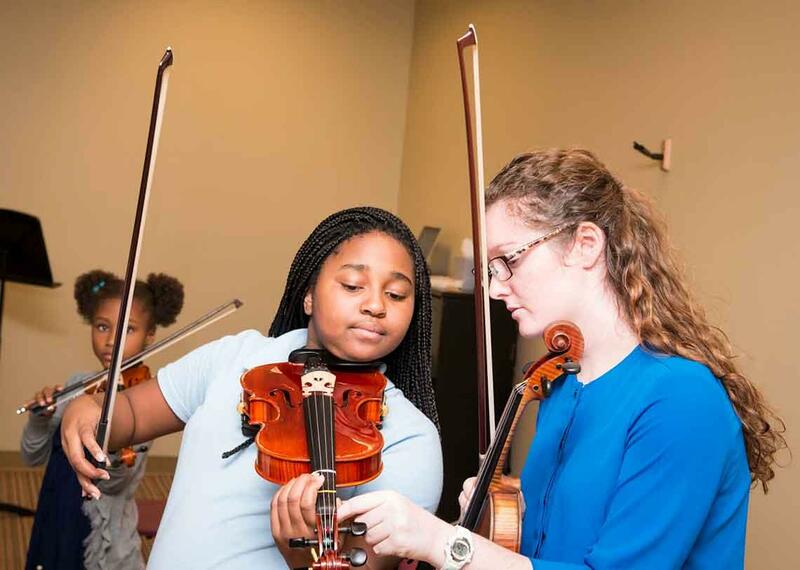 The program creates partnerships that provide teaching experience for Carolina students while providing accessible string education and supporting school music programs in the community. The String Project offers group beginning classes (beginners start in fall only), group second year classes, three orchestras and private lessons. Students with at least a year of experience may join for classes and lessons when space is available. All classes take place in the beautiful String Project Building adjacent to the School of Music Building at 851 Park Street and parking is convenient in the Discovery Parking Garage. 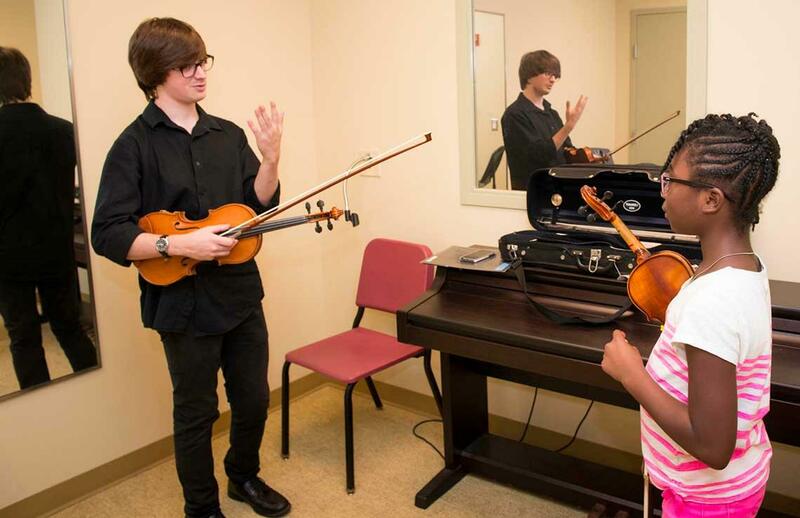 An important aspect of the program is an affordable fee to make the program available to children who might not otherwise have the opportunity to learn a string instrument. A limited number of scholarships are available based on financial need. Undergraduates learn new skills and test their roles as professionals in an environment that rewards competence. 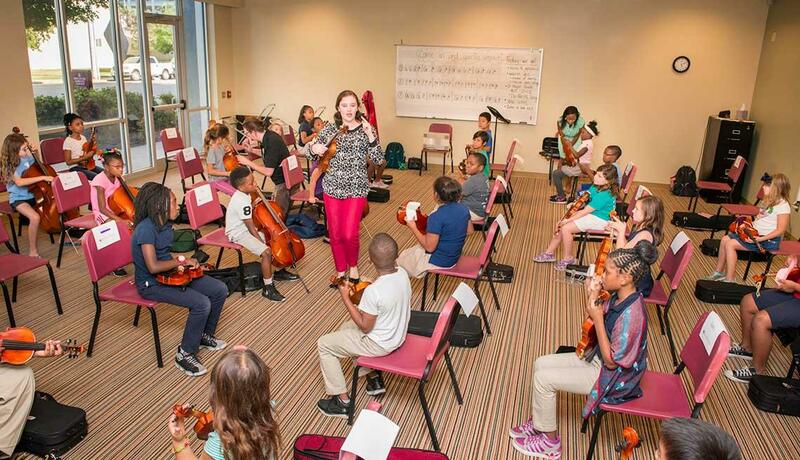 Many orchestra teachers throughout the state were undergraduate teachers in the USC String Project. 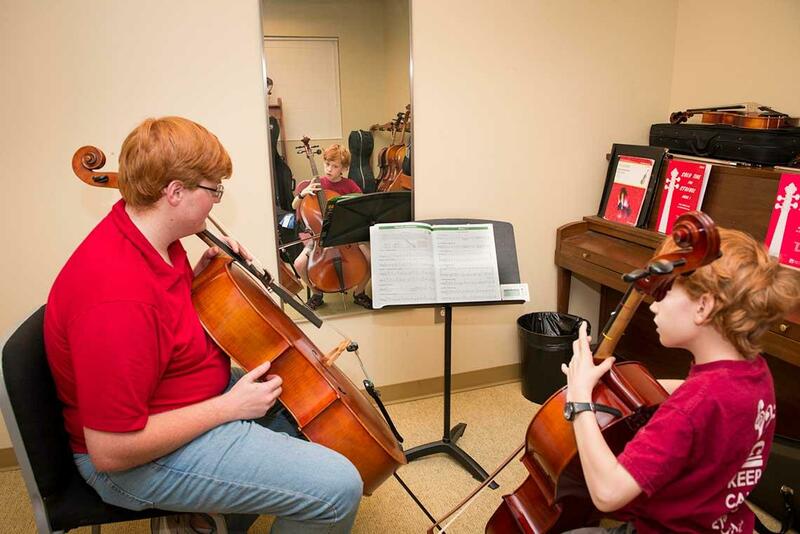 Our Open House is an opportunity for those interested in learning the violin, viola, cello or string bass. Learn more about our program. We will have instruments for people to try! 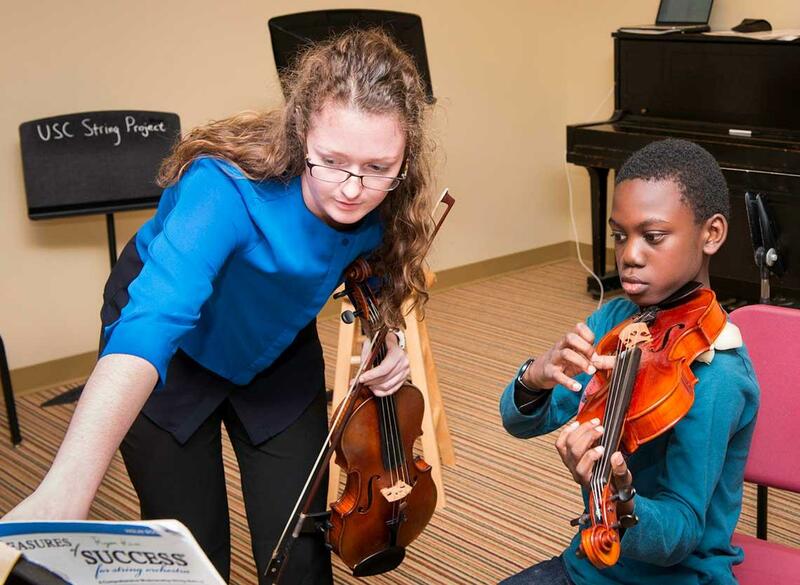 Please note: Students in the String Project must enroll in their school orchestra program if one exists and when they reach the appropriate age for membership. All String Project students (2nd year and above) are expected to be in one of the associated orchestras: Silver Strings, Concertino or Intermezzo. Contact the USC String Project at 803-777-9568 or uscsp@mozart.sc.edu. Adult Silver Strings 1 (beginners): Tuesday at 5:30–6:30 p.m. Adult Continuing Class: Wednesday 5:30–6:30 p.m. plus Concertino Orchestra (5:45-6:45 on Thursday). 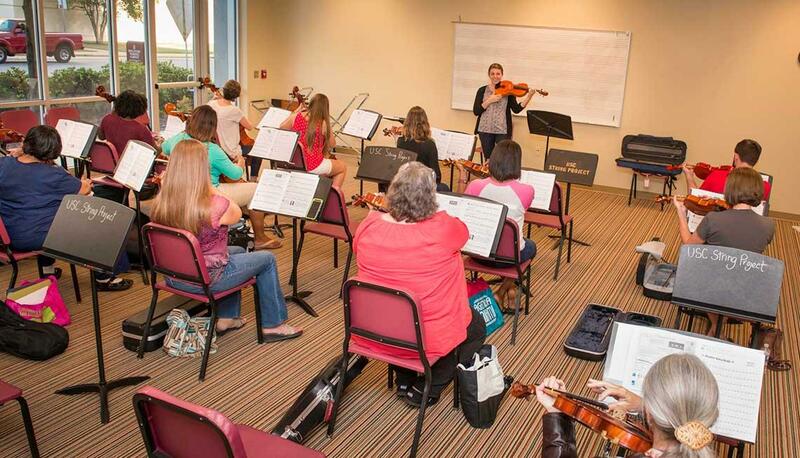 Adults who pay for both orchestra and lessons may participate in the continuing class without an additional fee. They understand the focus of the class is on the 2nd year adult student. Beginning in the 3rd year of study, adults may select private lessons and rehearse with the Concertino, Capriccio or Intermezzo Orchestras. Tuition: $90 per semester for orchestra; 10 half-hour lessons = $150; 10 one-hour lessons = $300. Adults must be enrolled in orchestra to get this rate. Beginning classes for children take place twice a week (Beginning in the fall and continuing into the spring). The 12-week semester follows the university’s academic calendar. Students must provide their own instruments or rent them from a local music store. Our staff will measure each student and recommend the appropriate instrument size. Children and interested adults register at a beginning class orientation on September 4, 2018. The beginning students in the String Project are 3rd, 4th graders or 5th graders and meet twice a week in a large group class. During their first year, students learn the basics of string playing in a class of 25 students taught by a lead teachers and two assistants. Beginning class students do not need to be able to read music; we will teach them during the year. Tuesday and Thursday - 4:30 – 5:30 p.m.
Wednesday and Friday - 5:30 – 6:30 p.m.
Tuesday and Friday - 5:30 – 6:30 p.m.
Students are organized in small groups, meet once a week and also participate in the Silver Strings Orchestra. Students participate in one class (Tuesday or Wednesday) and Thursday night orchestra (5:30-6:30). Tuesday - 4:30 – 5:30 p.m.
Tuesday - 5:30 – 6:30 p.m.
Wednesday - 5:30 – 6:30 p.m.
Thursday - orchestra rehearsal - 5:30 – 6:30 p.m.
Students begin private instruction and are divided into curriculum levels. Families select the available lesson time that fits their schedule. 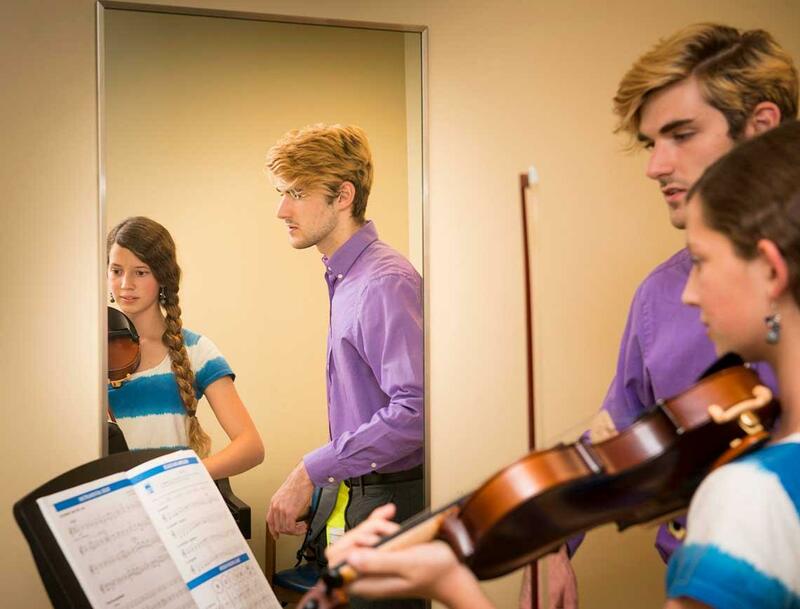 One private half-hour lesson per week and rehearsal with their orchestra from 5:45 – 6:45 p.m. on Thursday evenings. Students have mastered the skills from a second year method book. These include consistently well-shaped left and right hand, the ability to play simple melodies with good intonation and characteristic tone. Students are able to keep a steady beat and understand note values appropriate for level. Students demonstrate well-disciplined personal demeanor during rehearsals and performances. One private half-hour lesson per week and rehearsal with their orchestra from 6:15 – 7:15 p.m. on Thursday evenings. Students have mastered entry level skills for Concertino PLUS can play slurs and string crossings with a good tone. Students enter with an understanding of flats, sharps and can play the appropriate finger patterns for keys common to literature for the level. Students are able to match pulse and rhythm and demonstrate well-disciplined personal demeanor during rehearsals and performances. One private half-hour lesson per week and rehearsal with their orchestra at 4:30 – 6:00 p.m. on Thursdays. Students demonstrate intermediate level aural skills. Left and right hand position are well-formed, yet relaxed. All players should have a basic understanding of shifting to 3rd and or 4th position. Students understand the subdivision necessary for less predictable rhythms and the altered finger patterns for both major and minor keys. Students should be able to master the technical demands of the music early in the rehearsal process so they can follow the conductor and be a contributing member of the ensemble. Silver Strings 1 students give an “Informance” in December, performing for their parents and demonstrating the skills they have acquired to that point. In December, students in the Silver Strings2, Concertino, Capriccio and Intermezzo Orchestras perform at a community church or auditorium. 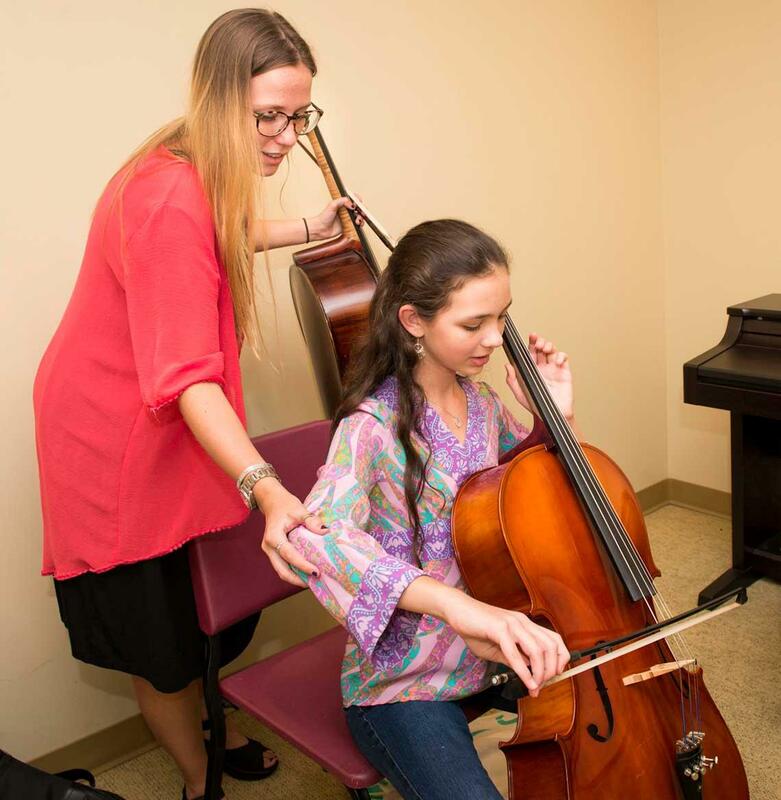 Students in the Concertino curriculum and older perform in master classes designed to give students a performance opportunity and immediate feedback. In April to early May, students perform in studio recitals or in a solo recital. The beginning classes and all orchestras perform in a year-end concert at the Koger Center for the Arts. Report cards are issued twice a year to students in all levels. Your philanthropy makes the USC String Project possible. Donor support enables USC to provide undergraduate music students a modest stipend for their work to encourage participation. Learn how you can help.